"We were unable to contact our landing party before we were forced to answer the distress signal. Our inability to reach the landing party is strange and I am concerned." This is a very poignant episode with a story that revolves around the love of a mysterious entity, called the Companion, for a human out of the past named Zefram Cochrane. The guest stars include Glenn Corbett, a reliable character actor perhaps best known for replacing George Maharis in the popular early 60's adventure series Route 66, as Cochrane. The other guest star is Elinor Donahue, well-remembered for her role as Kathy Anderson on Father Knows Best, as Commissioner Nancy Hetford. Hetford's plight is the genesis of the story. A victim of a rare disease, Kirk, Spock and McCoy transport her in the shuttlecraft Galileo from her assignment as a representative of the Federation in a peace negotiation. Suddenly, a cloud-like entity hijacks the Galileo and tows it to a planetoid called Gamma Canaris. Upon landing, they meet Cochrane who reluctantly reveals that he is, in fact, the inventor of Warp Drive lionized in Earth history for more than 150 years past and was brought to the planet by this entity and rejuvenated. He further reveals that the shuttlecraft party has been brought to the planet by the same entity to "keep him company" and they that will not be leaving. Not accepting captivity and concerned for the health of the Commissioner, Kirk and Spock first try attacking the entity and then communicating with it. Using the Universal Translator, Kirk is able to speak with the Companion and it is revealed that the entity is female and that "she" loves Cochrane. Cochrane must come to grips with the reality of his situation and his own feelings about this alien entity as Commisioner Hetford deteriorates in health to the point of death. This unusual story is well-conceived and well-acted by all. Corbett is very believable as the man "out of time." Donahue also adds to the quality of the episode with a good performance as the cranky Commissioner who is "infuriated, deeply put upon and absolutely outraged" by the interruption to her journey yet won't accept the reality of what that interruption means. The special effects that create the Companion are fairly cheesy but this does not detract too much from the tale. This is definitely one of the most lyrical Star Trek episodes and a personal favorite. It stands out as one of the most unique love stories in all of science fiction. Random Notes: Mr Scott is in command of the Enterprise in this episode. Both DeForest Kelley and William Shatner both made guest appearances on Route 66. The character of Zefram Cochrane emerges again, although significantly changed, in the Star Trek: The New Generation feature film First Contact. This is another unusual episode for Star Trek that features another pair of well known guest stars. Julie Newmar, who plays Eleen, is well-remembered for her portrayal of Catwoman on the Batman series from this same year. A Klingon agent, Kras, is played by Tige Andrews who, the next year, took on the role of Captain Adam Greer in the hit series The Mod Squad. Another pivotal role is Maab, the Capellan who assumes leadership of the tribe by violence, well-acted by Michael Dante who appeared that year as Crazy Horse in the short-lived series Custer. Capella is a planet that Dr. McCoy had been stationed on for a few months and he provides a briefing on the war-like nature of the Capellan people and their devotion to honor. The mission is to secure mining rights on the planet, so Kirk, Spock, McCoy and a "red shirt" beam down to the planet, but alas, the red shirt does not survive through the titles. When the landing party is confronted by Maab, a Klingon agent shows himself and the crewman overreacts, reaching for his phaser and is killed by a Capellan with one of their throwing weapons. This episode truly has all the elements that make a Star Trek episode great. There are story subtexts, intrigue, action, humor and great character bits. Andrews is appropriately slimy as the immoral Klingon. Dante gives a multi-layered performance in what could have been a one-dimensional role of the rebellious would be Tier. Julie Newmar is enjoyable in her role as the widowed wife of the Capellan leader (the Tier). She and McCoy form a relationship that is an amusing counterpoint to the main story of betrayal and flight. Maab uses the occasion of the mining negotiations to foment his own revolution against the aging ruler of Capella. Eleen is pregnant and despite this, realizes that when her husband dies that, by the laws of her people, she must die as well. But Kirk cannot allow her to be murdered right in front of him and saves her life. This breaks a sacred taboo of the Capellans that no man may touch the wife of a Tier. While Klingons keep the Enterprise busy in space, the landing party escapes from the encampment and flees into the rocky wilderness with Eleen. She is totally uncooperative and only McCoy's special medical skills can convince her to allow him to care for her and the unborn potential ruler of the tribe. There are some great action scenes that are actually filmed on location at Vazquez Rocks in Southern California. Kirk and Spock use all their wiles to keep the landing party and the girl alive. This is one episode of many in Star Trek that uses the metaphor of two great powers (Federation and Klingon) confronting each other in proxy battles of territory and ideology that were especially potent in that era of Cold War and the conflict in Viet Nam, although this episode is not quite as blatant as A Private Little War or Errand of Mercy. Random Notes: As in Metamorphosis, Mr. Scott is in command of the Enterprise in this episode. Julie Newmar had played a robot in the short-lived series My Living Doll in 1964. Image Transfer Review: It is consistently a pleasure to view the image transfers of this series. Although a price is paid in that some of the special effects of that era do not hold up, it is worth it for the richness of color and crispness of detail. The sets on Star Trek: TOS is one of the most underrated aspects. Note the attention to detail given to Cochrane's house in Metamorphosis. Audio Transfer Review: The 5.1 soundtrack is center channel based, with occasional sweeping, incidental music and explosion effects filling out the speakers. The dialogue is clean and well-rendered. Although neither of these episodes exploit the remastered sound very much, it still adds a pleasant fullness to the viewing experience. Extras Review: This disc continues the same features as the others in the series: scene selection, preview trailers, liner notes, subtitles and captioning. This is a fine disc to own. Both episodes stand alone as excellent science fiction stories and are among the best of Star Trek. The interesting guest stars add value for fans of television trivia. 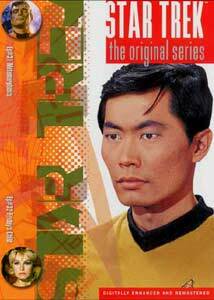 Dr. McCoy fans will enjoy his prominent role in both episodes taking care of beautiful women.